The great outdoor is pretty inviting as summer draws to a close. We have been frolicking from one beach club to another since October; the very reason why I'm super tan as of the moment. And last weekend, we soaked up the sunshine as we cruised around Palm Jumeirah on board an RIB boat. Ed and I were invited to hop on aboard the newest member of the Xclusive Tours fleet for a 90-minute sightseeing tour from Dubai Marina to The Palm to Burj Al Arab. It's our first time to see these iconic places from a different perspective; hence we excitedly made our way to Dubai Marina promenade to join the boat tour. Xclusive Tours' newest baby is an RIB or a rigid inflatable boat. I must say, I was scared when I saw how small it is compared to the yachts around the marina, but after the safety briefing I realized there's no need to panic as I was in good hands. Bags stowed. Life jackets worn. Cameras out! When everything's set, Karim - the boat captain/tour guide, commenced the tour with a slow cruise in Dubai Marina, giving us a thorough insight into the concrete jungle and the on-going Dubai Eye construction. It was more like a lazy cruise, but not until the we reached the sea. That's when the fun started! The engine roared as we sailed away on a high velocity speed towards the Palm Jumeirah. A few times, Karim surprised us with stunts that me feel like I was in a roller coaster. We bounced through the waves, sailed sideways... all things I never imagined this little blue boat can do! I savored every second of the boat ride, despite the fact that I was a little terrified. I don't get to see JBR and the 5-star hotels on the crescent of The Palm from the sea on a usual basis, so I had to remind myself to calm down and just enjoy the view. The highlight of the sightseeing tour around The Palm is, of course, Altantis! The luxurious resort looks even more dazzling from the sea! The boat stopped for photo ops and for interesting facts from our tour guide. We were halfway through the tour, but I was already convinced that it's one the best ways to explore Dubai! 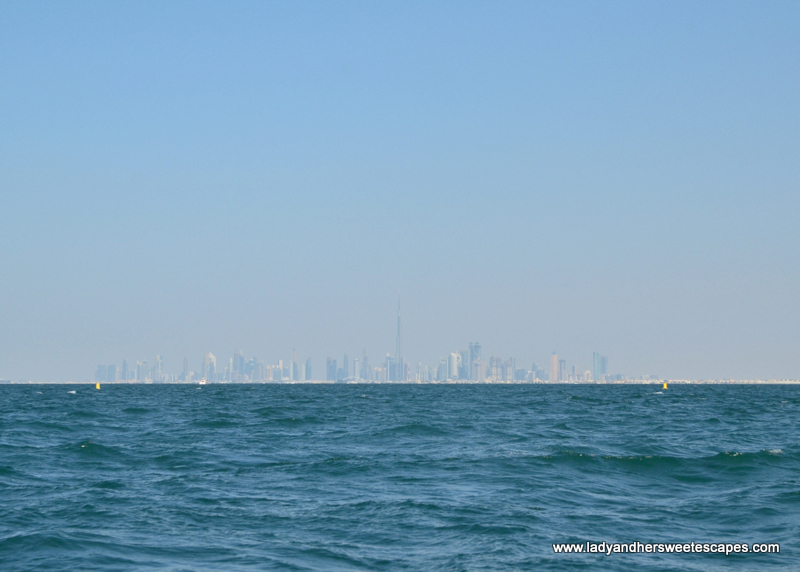 After Atlantis, we sailed to the other side of the crescent and caught a glimpse of the fast-changing Dubai skyline. It is currently punctuated by Burj Khalifa, but will be dominated with more insanely tall towers in the near future! The sightseeing boat made its second stop across Burj Al Arab. Again, it was another first for us. 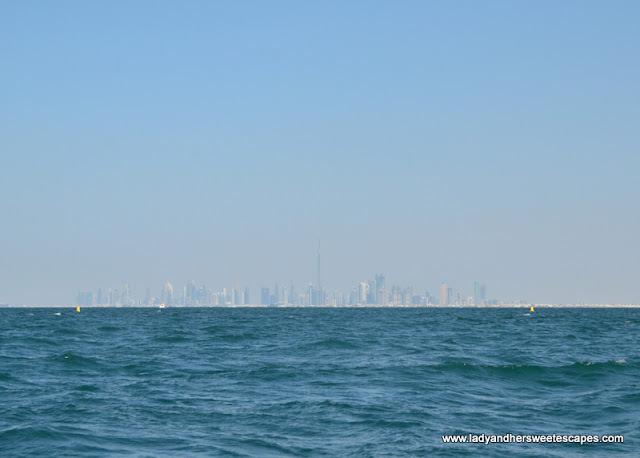 It was our first time to see Burj Al Arab and Jumeirah Beach Hotel from behind. These Dubai icons look more fascinating out there! The wave and sail-inspired structures provide a perfect backdrop to the Arabian Gulf. On our way back to Dubai Marina, we passed by Pier Chic - Dubai's most romantic restaurant which is still waiting to be ticked in my 20 before 2020 list. We also sailed near Princess Island - a private island given by the Sheikh to his wife as a wedding gift. And we saw the famous Cayan Tower - the world's tallest twisted tower. Princess Tower, world's tallest residential building, in the center. Cayan Tower, world's tallest twisted tower, farthest to the right. Ed and I both agree that the 90-minute sightseeing boat tour is one the best experiences we've had in Dubai. It's exhilarating, informative and so different from the rest. Karim gave us a thumbs up in the photo below, but really, it's him and Xclusive Tours that deserve the gesture! Thumbs up to Xclusive Tours for the awesome sightseeing boat tour! We were invited experience Xclusive Tours' sightseeing boat tour.